LA Tenorio provided the much needed support for their import Justin Brown in Ginebra's 113-98 win over rival Star in their Manila Clasico showdown on Sunday. Tenorio finished the game with 21 points, 2 assists, 1 rebound, and 1 steal while Brownlee dominated the game with 30 points, 15 rebounds, 6 assists, 4 blocks, 2 steals, and 0 turnover. 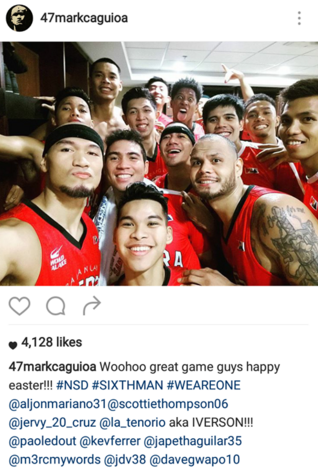 Their teammates especially Mark Caguioa was so happy as they deal Star its first loss in the Commissioner's Cup 2017. He even gave LA a new nickname "Iverson" after such a heroic performance.